These programs include ones in your startup folder, Run, RunOnce, and other Registry keys. You can configure Autoruns to show other locations, including Explorer shell extensions, toolbars, browser helper objects, Winlogon notifications, auto-start services, and much more. Autoruns goes way beyond the MSConfig utility bundled with Windows Me and XP. Version 13.94 is a freeware program which does not have restrictions and it's free so it doesn't cost anything. 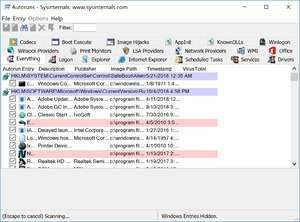 For security reasons, you should also check out the Sysinternals Autoruns download at LO4D.com which includes virus and malware tests. Additional screenshots of this application download may be available, too. Sysinternals Autoruns download been highly rated by our users.